Any vitamin A-rich food can provide you with some retinoic acid. Your body can turn the vitamin A-precursor beta-carotene found in fruits and vegetables into retinol, the form of vitamin A found in animal foods. Your system can then break down the vitamin to form retinoic acid. Getting the recommended 700 micrograms per day for women or 900 micrograms per day for men of vitamin A is essential for proper vision and immune function. Beef, veal and lamb lungs, kidneys and liver are among the foods with the highest retinol and vitamin A content. 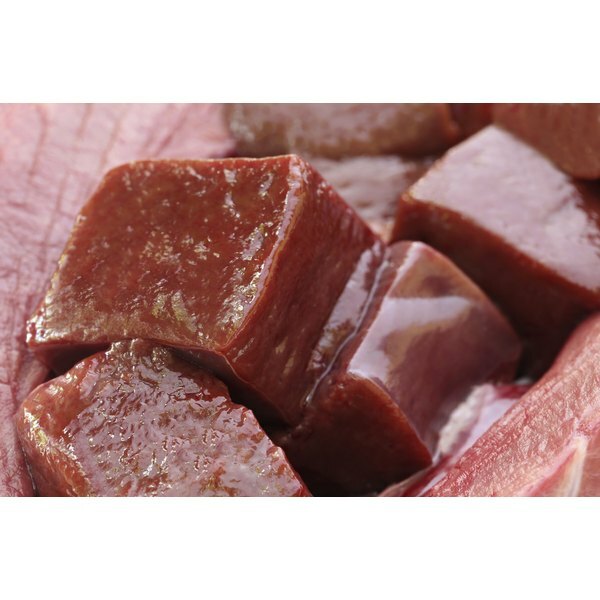 For example, a 3-ounce serving of lamb liver provides 6,610 micrograms of retinol, or 22,098 international units of vitamin A, and a 2.4-ounce serving of beef liver has 6,411 micrograms of retinol, or 21,566 international units of vitamin A. Servings of beef, veal and lamb meat otherwise provide only trace amounts of vitamin A. Pork and poultry products provide only small amounts of retinol, unless you eat the livers, kidneys or giblets of these animals. A cup of diced chicken giblets provides 5,194 micrograms of retinol, or 17,297 international units of vitamin A, and a 3-ounce serving of pork liver has 4,594 micrograms of retinol, or 15,297 international units of vitamin A. A 3-ounce serving of stewed chicken only provides 33 micrograms of retinol, and 3 ounces of 85-percent-lean ground turkey have just 30 micrograms. You can also get your daily dose of retinol from fish and seafood. Among the better sources are bluefin tuna, with 643 micrograms of retinol, or 2,142 international units of vitamin A per 3-ounce serving, and king mackerel, with 214 micrograms of retinol, or 713 international units of vitamin A per serving. Many other types of fish and seafood also provide vitamin A, but in smaller amounts. Milk is often fortified with vitamin A, making dairy products a source of retinol. Fortified skim milk provides about 149 micrograms of retinol per cup, or 500 international units of vitamin A. Eggs provide about 99 micrograms of retinol per large egg, or 362 international units of vitamin A. The most brightly colored fruits and vegetables often contain the most beta-carotene, which provides a yellow or orange color. For example, a cup of mashed sweet potato provides 51,627 international units of vitamin A, and the same amount of canned pumpkin has 38,129 international units. Carrots and winter squash are also excellent sources of vitamin A, as are green leafy vegetables. A cup of canned spinach has 20,974 international units of vitamin A and the same amount of cooked collards has 19,538 international units. Good fruit sources of vitamin A include cantaloupe, mangoes and dried apricots.